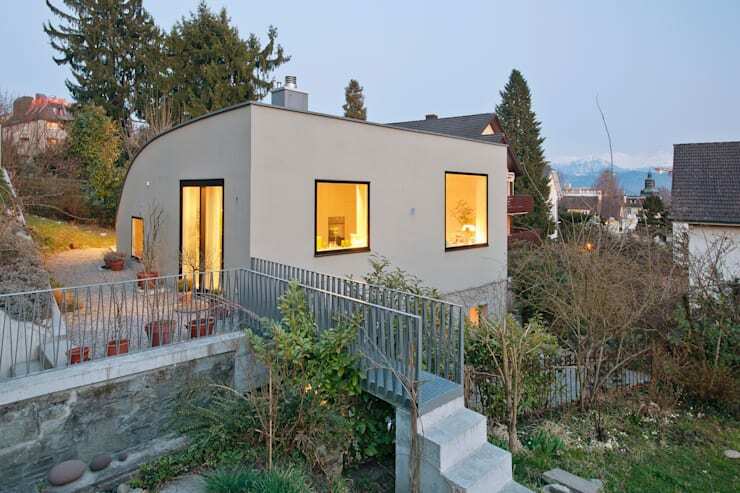 Architects professionals Lengacher Emmenegger, have used a prime plot of land in a quiet area of Lucerne, Switzerland, which is surrounded by large pine trees, mountains and rushing water, to create a modest and minimalist house that stands out from the rest. In addition to having taken full advantage of the area available for construction, excellently implementing and distributing the spaces available, the formal design of the house presents very misleading volumes and shapes. This property creates different spatial perceptions depending on what you appreciate in design, combining this optical effect with a very unique shape. You will love the organic curve of the roof! 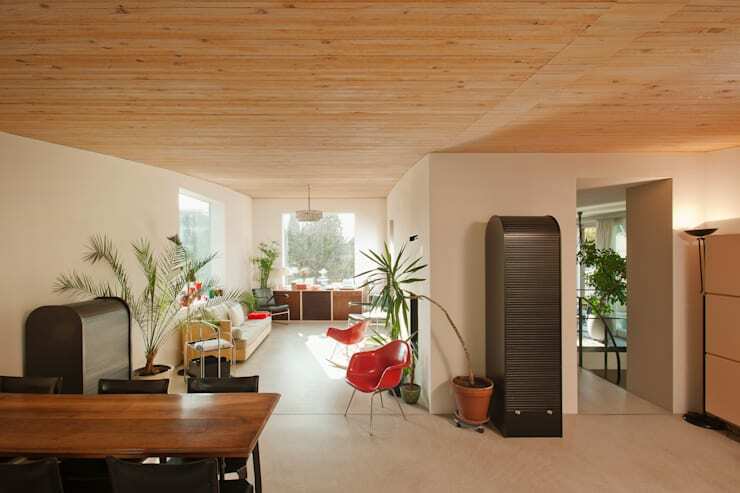 Get prepared to go and meet this cosy and modern home in this ideabook! A wide shot of the structure shows us the different heights and shapes used throughout. 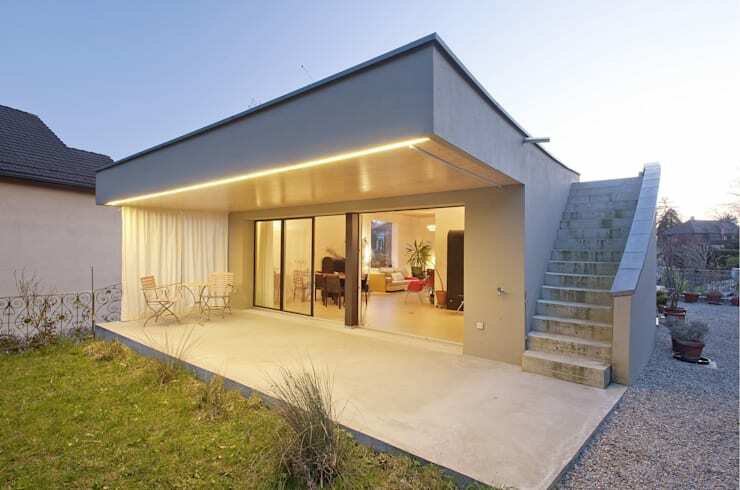 The architects have taken advantage of the land available to them, distributing different sections of the house so that it moulds into the landscape. A narrow walkway connects the home with the surrounds, while keeping the house more private from the neighbourhood. At first glance, the minimalist and simplicity of the design and construction is very striking! It truly complements and decorates the landscape. If we look at the northern facing facade, we can appreciate the home that much further. 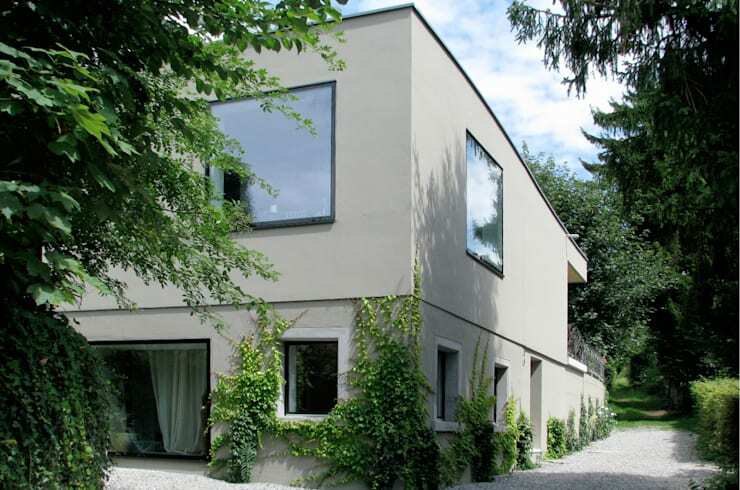 The edges of the facade are finished with very clean lines and give a feeling of purity. The outer walls are presented in a bone white tone, contrasting with the dark colours of the door frames and windows. Matching the frames, we can see the line of the roof, which contrasts with the colour of the walls. 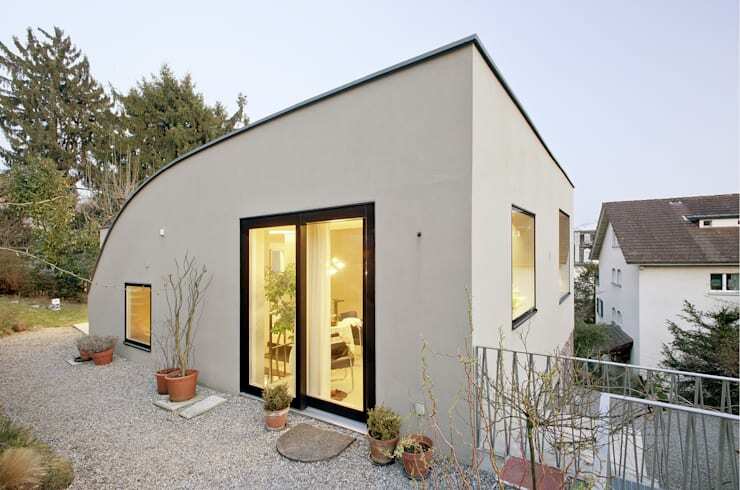 It also enhances the curved lines of the house. This is the only home on the block with such an interesting and unique roof! The rear view of the housing seems to be a completely new house! It shows us that on the other side we were just seeing the tip of an iceberg, while the rest of the home was hidden by the landscape. But now we can see it clearly! 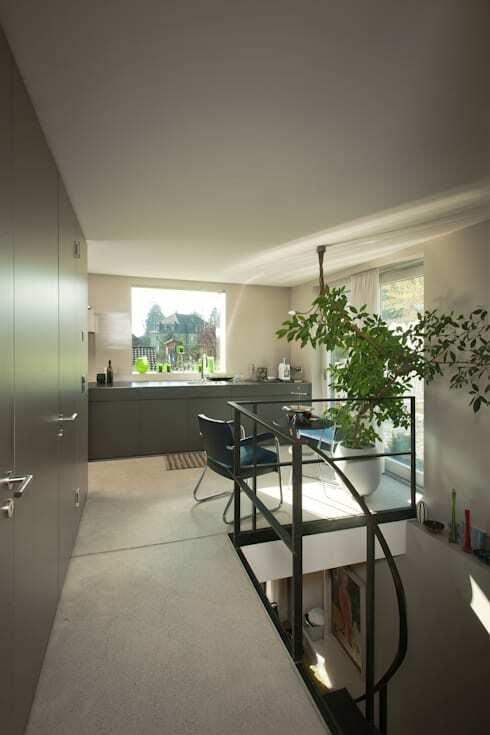 In this image, we can see two levels of the house and a basement peeking out, which is very typical in European homes. The concrete facade is decorated with creepers and vines, adding some natural colour to the overall look and feel of the house. On the east facade of the house, we stumble across this pleasant terrace—a space where the floors, walls and stairs are built entirely from clean concrete. There is a nice contrast between the cold concrete floors and the lush green grass as well as the wooden floors that we can see inside the home. The large, sweeping roof creates an illusion of lightness thanks to the band of yellow lighting that runs along its perimetre. This transforms this site from a normal little terrace into a romantic spot with the simple click of a switch. If we move closer to the interior of the house, we notice that the interior design totally differs from the outside design. Large glass doors spatially divide the interior space from the exterior space, highlighting the different materials and decor items used in each. 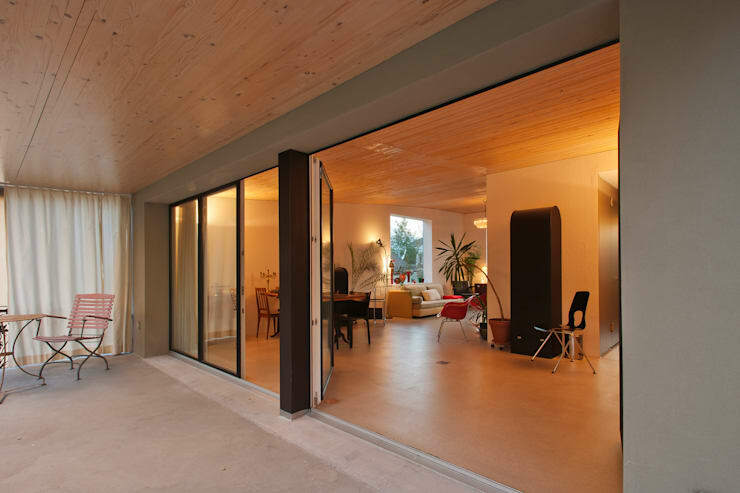 Wood is the main material throughout the interior of the home, extending to the ceiling that hangs over the patio. This gives a subtle feeling of unity between the two spaces. Let's take a look inside to get a better idea of the decor and furnishings that we will find inside the house. If we look at the upper level of the house, we can see that the same simple lines and materials that we found in the exterior design have been repeated here. We can also see the curvature of the roof in more detail from this space, enhanced by the space where the white walls meet the wooden ceilings. The furniture featured in this space is eclectic, with different sizes and colors that add life and movement to the home. In the background, we can see big windows, which enhance the facade of the house—this time without the black frames. They also serve to flood this space with natural light! Look at these: Tips for bathing your home in natural light. 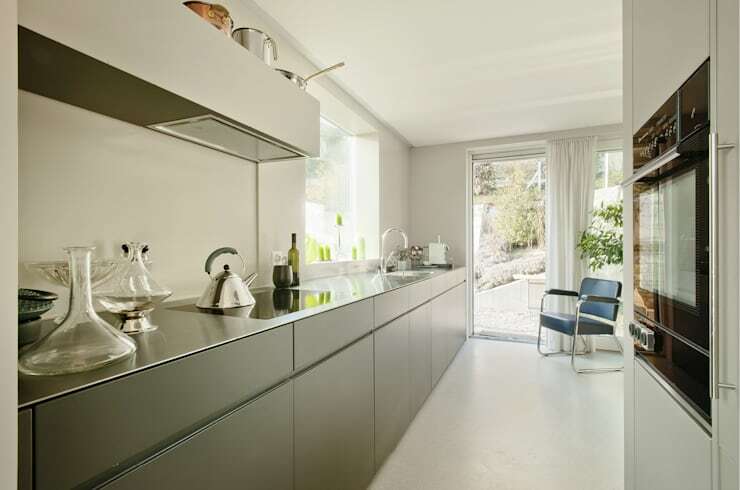 The kitchen is a sublime white space with touches of steel and chrome, which are accompanied with a gunmetal used throughout the lower kitchen cabinets. This combination invokes purity and minimalism, with simple horizontal lines creating a very clean and hygienic looking space. The function was the determining factor when designing this space, where the designers avoided adding anything unnecessary to this space. They didn't want to clutter the environment or hinder its elegance. The freshness of the white is further emphasised by the double glass doors at the end of the kitchen, which lead out onto the patio. Finally, we see the kitchen from another angle, connected by a corridor, which also leads to the vertical stairs in the core of the home. Here we can appreciate how vegetation has a strong presence in the home, adding natural beauty and decor. The corridor is also used as storage space, featuring a long row of closets along the whole of the left hand side. This allows items to be stored neatly out of sight, keeping the home chic, modern and minimalist. The stairs, like the roof of the house, curve all the way down to the ground floor with a spiral wrought iron railing that matches the finishes of the external door frames and windows. This home, which is small and big at the same time, perfectly combines a simple palette of colours and different spatial distribution, demonstrating how to use vertical and horizontal planes and make the most of every square metre available! If you like this home, you'll love this: Home of movie star glamour. Would you want to live in this beautiful home?